This 2-bedroom 2-bathroom condo is a corner unit with sunny southern exposure. The floor-to-ceiling windows offer views of Jenner Street, and partial views of the ocean. The master bedroom has a king bed, private bathroom, and a large closet. The second bedroom has a full bed and desk, should you need to attend to any work. There is also a twin air mattress available for your use. The kitchen is fully stocked with all cookware, dishware, utensils, and appliances. Laundry machines are in-unit, and there are two reserved parking spaces in the secure underground garage. Utilities and cleaning fees are included. If you love La Jolla vacation rentals, oceanfront locations, pool access, and comfort, this is the place for you and your family. 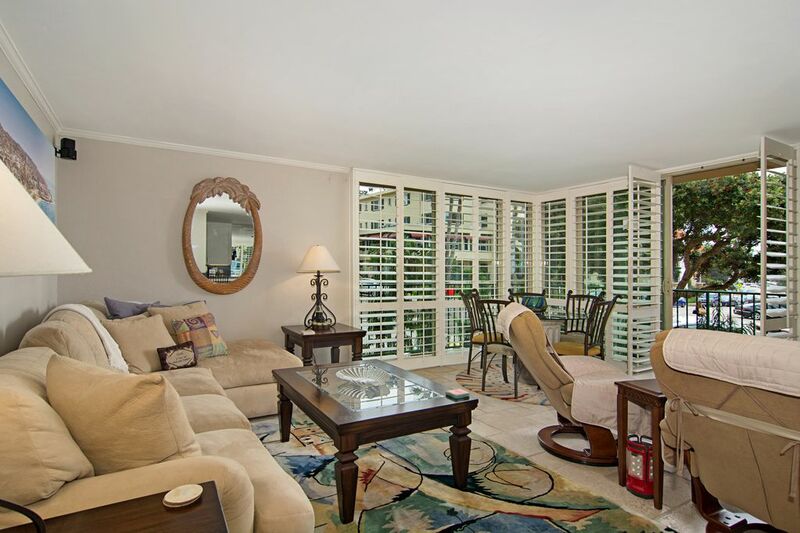 This corner condo is just a block from the famous and wonderful LaJolla Cove. Very nicely furnished and comfortable with ocean breezes. I thought it would be noisy but it was not, even with a bit of beach construction going on...everything was very quiet at night. La Jolla was experiencing unusually warm weather when we were there but the fans and AC unit in the Master Bedroom kept us cool at night. Easy walk to the beach and into town for restaurants and shops. And the Vons grocery store was like a wonderland emporium to we out-of-staters. We would stay again.